But the one thing that I really tried to do when they were little was to keep it interesting. For them and for me. Not all the time, of course. I am a big advocate of kids keeping it interesting all by themselves. Just playing and using their own imaginations. The following are just a few things I did with the kids. Maybe it will help you shake things up a bit if it’s getting a bit stagnant at your house. We would walk behind the house on the footpath along the creek. We meandered. And it was interesting. Sometimes hot but still interesting. We would think we spotted a snake in the water. Or see grass rustling and jump a mile. So one day I made a scavenger hunt list of things to find on our walk. But I was a bit riddlish (Maryism) with my clues so they had to really think about it. For example. Find a Pencil. The beavers from the creek would come out at night and chew down the trees that were located outside the yards. Most neighbors had wire mesh surrounding them. But this one neighbor didn’t and their tree stump was right out of a cartoon. Looked just like the point of a pencil. Then there was the Spool of Thread. You know the huge construction spools that are used for wire or cable. One had washed up on the creek side after a storm. Couldn’t leave the home of a hundred swallows off the list. Condominiums. Home tweet home. They would build their perfect, rounded, little clay nests in the eaves of the highway bridge. Anyway, there were other items on the list. Those are just the ones that spring to mind. But the kids loved it and it made it really fun for them. And for me. Once, after seeing a gorgeous full moon from my kitchen window, I loaded them into the car and drove to the other side of the creek and parked by the grassy plain. And just stared at the big, yellow moon. They loved it because they were in their pajamas. 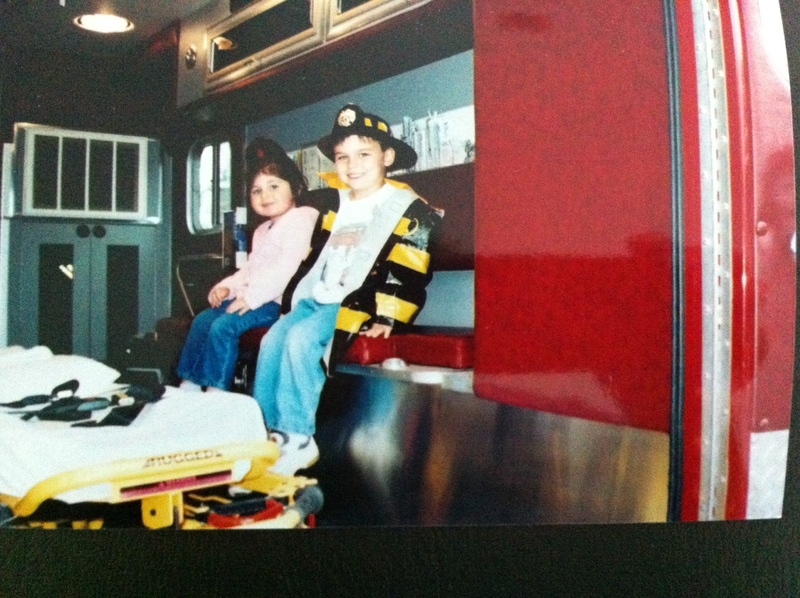 Another really exciting thing was having the firefighters come to our home. To visit the kids. I had called the fire department and set up a date. I invited all the neighborhood little ones. They all had a super time climbing into the trucks and asking questions. I laughed right back. Nope. Total coincidence. It was an old shirt. The only thing I did for those men is make them some brownies and some pasta to take with them when they left. My Annie and her friend, Ben. Anyway, you get my point. All you have to do is use your imagination. These were all simple and free activities. There are so many fun and interesting things to do out there. Lots of resources available. Pick up the phone. Could be a trip to the bakery to see how the doughnuts get made. Or to a community garden to dig around in the dirt. And it really doesn’t have to cost a dime. Just requires a bit o’ imagination. I am laughing once again. I’m still visiting the folks here in Rhode Island. Last evening I was going out and Annie, the thirteen year old, accompanied me. The weather was a little rainy and the temperature was dropping a bit. The norm for this part of the world in the winter months. My dad is always good for a last minute warning or bit of advice as I head out the door. Doesn’t matter that I am forty eight years old. This is what Annie heard him say to me. She observes me nodding my head in agreement, saying “Of course!” and closing the side door. I raised her so she should know a Rhode Island accent. But there are those occasions when something just gets lost in translation. Bless her little heart. So, my advice to you, if you are out traveling on the roads, be safe, go slow and please, please watch out for the black guys. 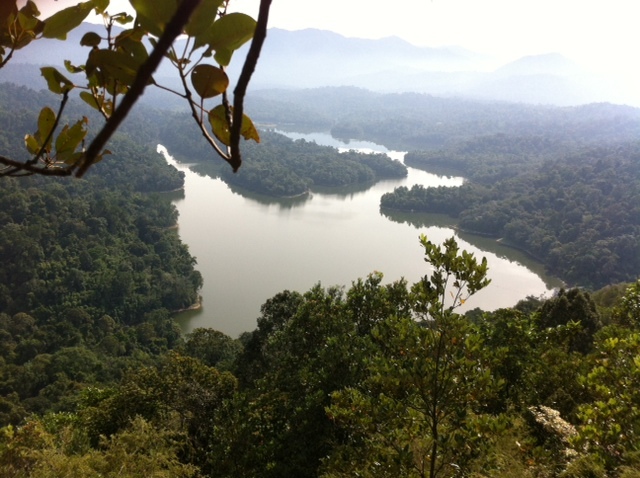 There is a group of women that get together once a month here in Kuala Lumpur for a guided hike to nearby areas. Yesterday was hike #2. At the longest and oldest quartz ridge in the world. Whew! That one was a bit rocky. In lots of ways. I don’t attend because I am a big fan of hiking. I actually prefer strolling along at a conversational pace. That’s just me. But I show up for these hikes because it is an opportunity to meet new folks, explore my surroundings, and learn something new. This is what we found on the road before we even entered the jungle. 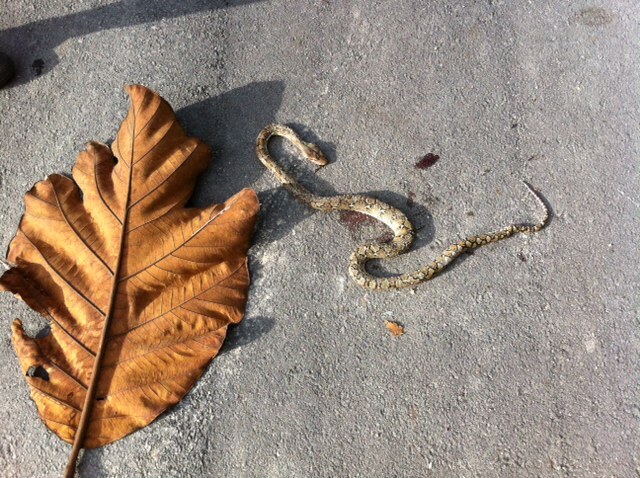 A baby python that had been run over by a car. The leaf in the photo is quite large. Enough to cover Adam and possibly a few of his descendants. Gives you an idea of the snake’s size. My thought was, “And just where is his Mama?? ?” These snakes are non-venomous but still dangerous. When they do bite they latch on and won’t let go. They also coil and could choke the life out of you. Good to have a knife handy. Our guide did. Because you know I asked him! 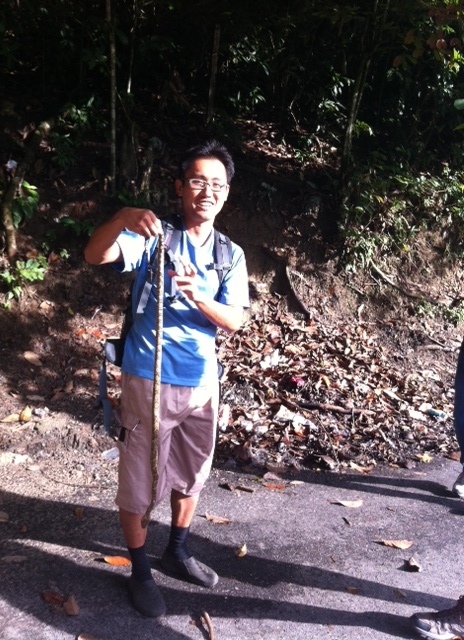 This is the guide, John, who is always willing to share helpful information about the jungle. Last hike we learned about the waste of a civet. These animals ingest coffee berries, slide them through their system and defecate whole beans. Without the bitterness. I don’t mean that the civet is no longer bitter. Just the coffee beans. Are you wondering what was in your cup of Joe this morning? He also told us how to poison our husbands using the palm. There are almost invisible shards like fiberglass. Stirring them into food or cups of coffee (civet brand or others) can lead to internal bleeding. John said really all you need is a knife in the jungle. There are berries to eat. Plants that retain water. And many other resources. Quite amazing. That John is not much bigger than a baby python but he is big in the jungle knowledge department. Saw this as we entered the jungle. 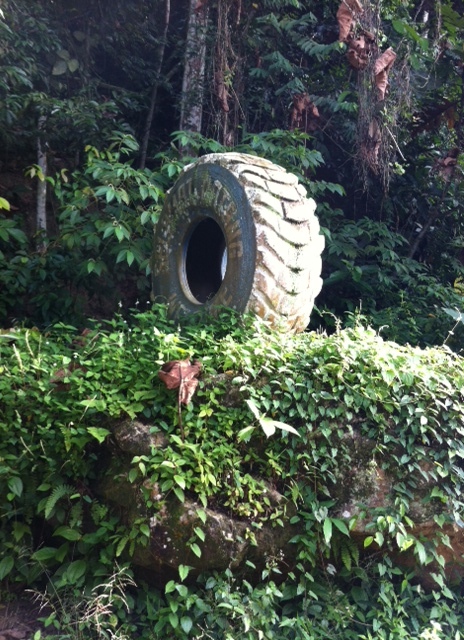 Just like I questioned where Mama snake was hiding I also wondered where the other three tires were hiding. It was spray painted with some type of advertisement. Using all jungle resources. 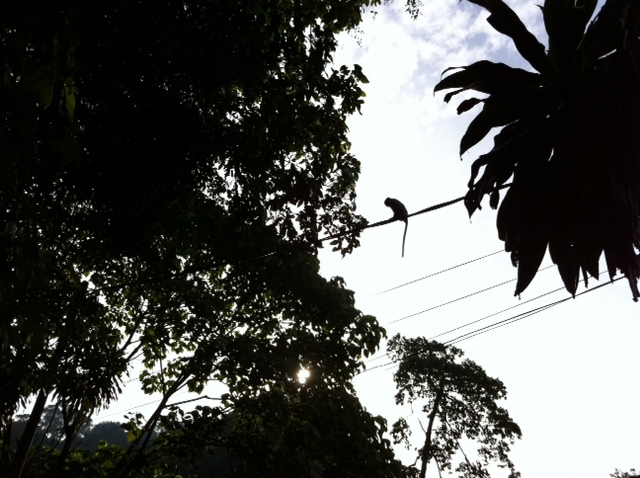 Still not even in the jungle and this little monkey was skipping along the wires above us. Most likely talking about us. Termites. Lots of them. I couldn’t help but think of the haves and the have nots. These fortunate insects will never run out of food in their current environment. 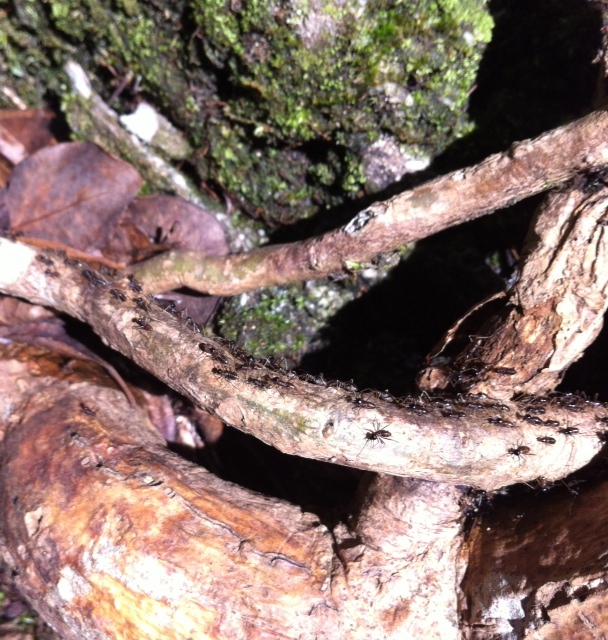 Moisture, fresh bark, fallen limbs and community. What more could a termite want? Meanwhile, there are a lot of termites around the world that are not so fortunate and have to resort to eating suburban fences. This is one of the views we had during the hike. Absolutely gorgeous. One could forget how very close one lives to the city. If you looked in one direction you spied the smog and pollution rising from Kuala Lumpur and its terrible congestion. The other direction was clear, sunny skies and clean drinking water! I have loads of photographs but only wanted to share a few of the highlights. Lest you get bored. Have a wonderful day! And don’t forget to look in the direction of clear, sunny skies!